A frosty and somewhat foggy start to my usual Tuesday trip to Brandon but with some excellent birding in superb autumn sunshine. No major rarities on site today, having missed yesterdays visit by 4 Whooper Swan, (can you believe my phone had no signal!!!) but great numbers of wildfowl on the pools and some substantial movement. My first large flock of the day was circa 75 Jackdaws heading south over Newlands, easily identified in the early morning mist by their unmistakable clucking. The River Pool Hide produced 2 Water Rail and over coffee in the big hide some 250 Greylag, 12 Snipe and fair numbers of Wigeon, Shoveler, Teal, Tufted and 4 Gadwall accompanied by a female Pintail. A short while later 5 male Pochard flew in to join 5 females who we'd spotted earlier from the Wright Hide. Some maintenance work was required today on several of our Barn Owl boxes and during our travels across the reserve we were delighted to see several large flocks of Redwing, literally dropping in over New Hare Covert, numbers by the days end were around circa 200. Skylark, 7 in number, were also recorded and a single Rook overflew, common enough but a very rare visitor to Brandon. 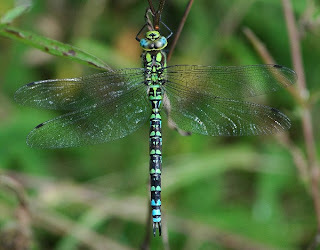 Also in the autumn sunshine I recorded a single Small Copper and 2 Small White Butterfly, plus a number of Migrant Southern Hawker Dragonfly (pictured). After the other guys had left I ventured back to the main hide alone for a final wind down and was lucky enough to pick up on a single Black Tailed Godwit, which dropped in on Willow Island for a brief respite, before making off to the west. A really enjoyable day which also included single counts of Mistle Thrush, Chiffchaff and Grey Wagtail. Today has set me up nicely for my departure on Thursday to Holland and in particular Tezel Island for more birding! !